A man has died in a landslide after Storm Callum hit as parts of Wales saw its "worst flooding for 30 years". Rivers burst their banks, homes were flooded, some were without power while travel was affected as Wales bore the brunt of torrential rain and wind. The man was killed after a landslip at Cwmduad in Carmarthenshire, one village is ready to evacuate and people have been told to stay at home. Police have said people should avoid Carmarthen due to rising water levels. The River Towy has already burst its banks and breached the town's flood defences and it is critically high as flood warnings remain in place across Wales. 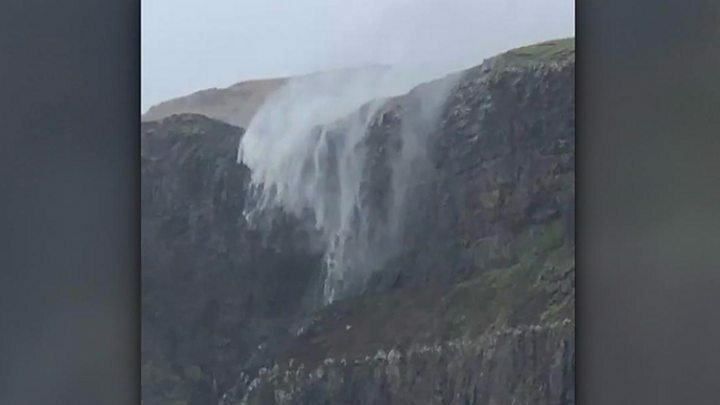 Carmarthenshire, Powys and Ceredigion were the worst affected areas and at Milford Haven, the strongest wind in the UK was recorded on Saturday as gusts of 60mph (97kmh) battered the Pembrokeshire coast. About 100 sheep have been washed away in flood water at Pontargothi in Carmarthenshire and Dyfed-Powys Police want anyone who see the sheep wash up to contact them. 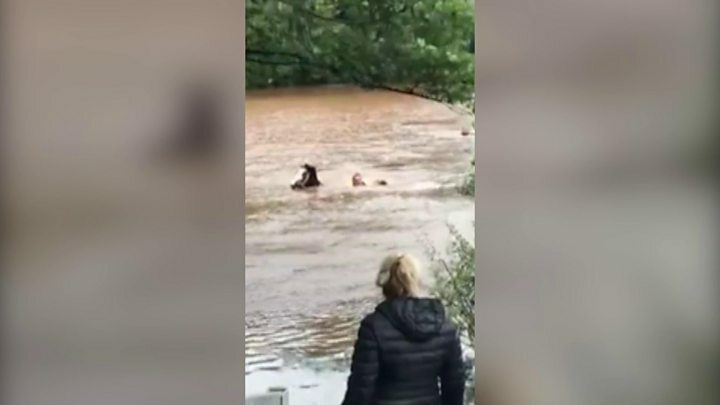 A horse, meanwhile, was rescued in Monmouthshire after being partially submerged by the flooded River Usk near Abergavenny. Capel Curig in Conwy was among the wettest places in the UK with 46.2mm (1.6ins) of rain, the wettest being Shap in Cumbria. Further flood warnings are in place in Scotland while about 2,000 homes and businesses in England have been without power with some flood defences breached. In England, a man died after he was swept into the sea in Brighton and two cars were crushed by a falling tree in Cornwall overnight. But elsewhere, the hottest October day in seven years was recorded in Lincolnshire as Donna Nook reached 26.5°C on Saturday afternoon. A Met Office amber warning for rain across south, west and some of mid Wales ran until 18:00 BST while the rest of Wales was on a lesser yellow alert for flooding until midnight on Sunday. "We have looked at the records and we are looking at records about 30 years ago when we had an event of this size and significance," said Aneurin Cox, of Natural Resources Wales. A number of key routes in Wales including the A470 Merthyr bypass, the A40 in Carmarthenshire and the main A4042 road between Abergavenny and Pontypool at Llanellen are shut. The A5 eastbound is shut at Bethesda in Gwynedd due to a landslip while the M48 Severn Bridge near Chepstow is also closed eastbound. Bridges crossing the swollen River Teifi in Ceredigion are closed at Llanybydder, Cenarth, Newcastle Emlyn, Llechryd and Lampeter. The flood defences in Carmarthen have been breached for the first time since they were built almost 30 years ago as the River Towy burst its banks. Vicki LeClerc, who lives in one of the 29 properties, said all residents stayed in their homes overnight, despite offers to transport them away, but water levels have continued to rise. "The canal is coming over the banks," she said. "My piano is currently on the sofa and everything we can salvage is upstairs. We're just going to sit and wait and see how bad it gets." Public transport in Wales is struggling as there are no trains between Swansea and Carmarthen, Cardiff and Aberdare, Machynlleth and Shrewsbury and Blaenau Ffestiniog and Llandudno. Replacement bus services are in operation on some affected routes but passengers are advised to check with Arriva Trains Wales' website. Arriva Trains Wales, on its last day of running the rail franchise in Wales, has told passengers: "Due to the severe disruption to train services, lack of available road transport caused by local road conditions, customers are advised not to travel as journey completion cannot be guaranteed." 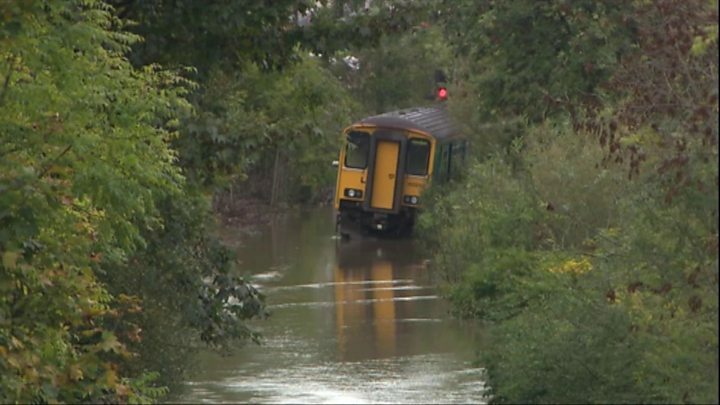 The guidance follows a train getting stuck in flood water near Penrhiwceiber, Rhondda Cynon Taff, where 30 passengers had to be rescued. Some ferry services to Ireland from Fishguard and Holyhead have also been cancelled and passengers have been advised to check before travelling. Thousands of homes lost power due to strong winds and falling branches but engineers have worked through the night to return power to the majority of households, with the worst of the winds believed to have passed.